St. Hierotheos was a very learned pagan from Athens who was converted by St. Paul in about the year a.d. 53. 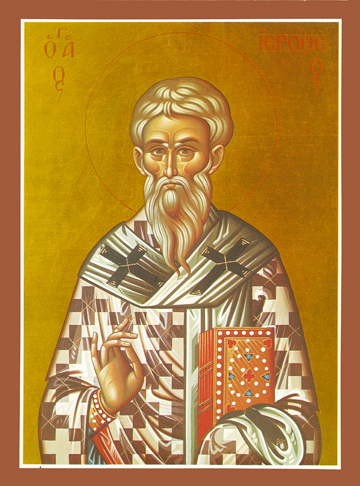 St. Paul also ordained him to become the first bishop of Athens. He is often also given the title in Greek of “Thesmothete” which means literally, “rule-setter.” In Athens, St. Hierotheos was a friend of St. Dionysios the Areopagite, whom he frequently visited and instructed more fully in the Christian Faith. St. Dionysios had also been converted and baptized by St. Paul. St. Hierotheos was known to be a fine singer, preacher, and writer of hymns, and converted many Greeks to the Christian Faith. By Divine Providence, St. Hierotheos was brought, along with St. Dionysious the Areopagite, to Jerusalem at the time of the Virgin Mary’s Dormition, or her falling asleep in the Lord, in about a.d. 52 or shortly thereafter. St. Hierotheos, whose name means “sanctified by God” in Greek, sang hymns at her funeral when he was with the Apostles who were gathered there. After a life of service to Christ, Whom he loved, St. Hierotheos was crowned with the wreath of martyrdom at the end of the 1st century.